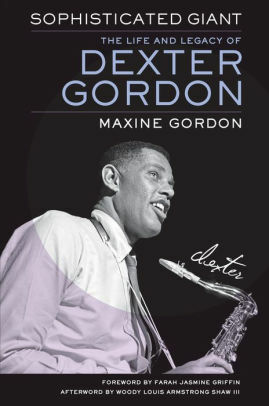 That quote from Svante Foerster’s novel is among the riches in Maxine Gordon’s Sophisticated Giant: The Life and Legacy of Dexter Gordon (Univ. of California Press), which was the subject of a lively, jazz-ambient conversation late last month at Labyrinth Books between Maxine and Richard Lawn, the author of Experiencing Jazz, and All About Jazz’s Victor L. Schermer. The only thing lacking was a set of speakers so that everyone present could hear samples of the tenor saxophonist’s massive sound; instead, people happily settled for the story of the fan who fainted when he heard the real thing in person. Gordon had originally intended to write his own story, which he imagined in the improvisatory spirit of The Ginger Man, with its “comic element,” its “unexpectedness,” the way “the thoughts would sometimes rush at you.” Rather than writing “along a linear timeline,” he “wanted to improvise and have the book play out like a long jazz set.” Although Maxine insisted that an outline was necessary, one of the strengths of Sophisticated Giant is her willingness to go with Dexter’s flow. The result is an intimate sense of how he passed his time, how he slept, what he dreamed, what he feared. Here, in spite of that nice pairing of runs, a demanding editor might be nudging the author to get to the filming of Round Midnight and the Oscar Night festivities and all that glamorous Hollywood stuff. Instead Maxine jumps ahead to let us know that after the film premiered in October 1986, she and Dexter returned to New York in time to watch the Mets defeat the Boston Red Sox and win the World Series. She then proceeds to devote a full page to Dexter’s fantasy of the 1986 Mets as a hard-swinging big band in which each player has an instrument or role to play, Keith Hernandez on lead alto, Gary Carter on baritone sax, and, no surprise, Daryl Strawberry and Dwight Gooden as the Dexter and Wardell of the tenor section, with Mookie Wilson on drums, Rafael Santana on percussion, and three vocalists, Tim Teufel, Lee Mazzilli, and Roger McDowell performing as The Amazettes. Now imagine that just as Maxine is temped to placate the editor and skip the baseball fantasy, a familiar voice in her head says Don’t do it and a familiar weight settles down next to her, causing the sofa to sink a bit. And instead of writing about Dexter in Paris and Hollywood, she goes back to Cuernavaca and how her husband exercises in the pool, drinks “horrible-tasting herbal teas,” and considers his afternoon nap the most important part of the day. Yes, baseball’s here again and I’m thinking that as much as I like Dexter’s Mets-as-a-big-band idea, I like it even better the other way around, with, say, a line-up of heavy hitters like John Coltrane and Sonny Rollins up front, Ben Webster hitting clean-up, Charlie Parker batting lead-off, and pork-pie-hatted manager Lester Young in the dug-out sending signals to Lady Ben. And on defense, how about Thelonious Monk on the mound, with his crazy stuff, and Bird in the outfield making unreal over-the-shoulder catches. And for the closer, the big guy who comes in to save every game in the top of the ninth, who else but Long Tall Dexter? Saturday the Princeton Record Exchange is hosting the 12th annual National Record Store Day, featuring three 50th anniversary Woodstock-related releases. The store opens at 10 a.m. and there will be a line.